One of the keys to reaching your audience is to acknowledge the important role that social media can play in the strategy of your company. According to the PEW Research Center, the majority of Americans now use Facebook and YouTube (68% and 73% respectively). Further,18-24 year old’s are visiting Instagram, Snapchat, Twitter, and a variety of other platforms multiple times a day! This knowledge can be a blessing to business leaders who understand the value of tying social media efforts to their brand goals. However, many brands today have placed a team member in charge of throwing up a few posts here and there without really delving into the possibilities of social media. Without open communication of your expectations, your social media team is adrift at sea without a compass. Perhaps you would like to see a growth in online sales conversions in the next 6 months. 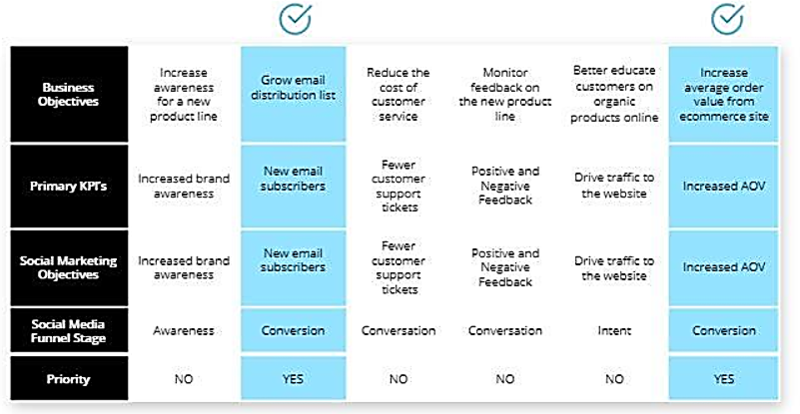 Maybe you want to minimize customer service costs. If there’s a competitor out there cutting into your market share, you need to differentiate your product from theirs. Identify one or two goals to focus on in the coming months. Each of these goals will reveal a distinct strategy the social media team should implement. Set a meeting and give your team an idea of where you want to improve, and then set benchmarks. Targets can be set using your own brand knowledge, historical data, or industry guidelines. Realize that if this is the first true effort to quantify the ROI of your brand’s social media, these may have to be adjusted throughout the process. Once the goals for the social media team are in place, the next step is to set up the tools you will need to collect all necessary data. To find your target audience and identify which platforms should be your focus, you first need to view your website and social analytics. Google Analytics is a free tool that can help you track your customer journey through your site and gives you demographic information for your site visitors. If you don’t already have an analytics program running the data, set one up today and track your current efforts for a month. This, combined with insight reports for your social media pages, will give you a starting point. Make sure that you have a way to track absolutely EVERYTHING. Again, there is no way to improve if you are blindly throwing up post after post. Make sure that your team is familiar with the above tools to track click through rates. This will determine the real success of each post. The goal here is to get beyond the vanity metrics and to see concrete examples of social’s influence on the customer journey. These tools are relatively easy to learn and invaluable to your organization. Many brands neglect to acknowledge the distinct differences between paid social media and organic social media efforts. It can be tempting to look at social as a “free” service that shouldn’t cost anything besides time and content to maintain. However, the benefits of paid reach are not something that brands can afford to ignore. Organic content can focus on the long-term message of the brand, and communicate company culture. It can provide a window for customer service and recruiting outreach. This is is a long game of reputation and attention. Create fun, shareable content for your followers. Share viral content related to your brand. Tag leaders in your industry and those you admire or work with. This communicates the big picture and personality that social media audiences are looking for. Paid content offers unique benefits to those who wish to grow their social media audience quickly and effectively. It starts with successful organic content OR an advertisement for a special offering (digital coupon, one-day sale, etc). Through focusing on an audience that is interested in your product as demonstrated by data, paid content is a quick way to capture attention. To keep attention, however, you’ll have to consistently offer value through your organic content. Finally, implement a process for analysis and reporting on the data. Once a month, ensure that your team is compiling the data relevant to your benchmarks and identifying the posts that are successful. The key is to develop reports on the month’s successes and flops, and then duplicate what works. Abandon strategies that did not meet benchmarks or serve the higher business objectives. Then, use those content slots to try new ways to engage. Each blank space on your social calendar is an opportunity to experiment with new strategies. Furthermore, you’ll know that you’ll be able to see the results of each post in concrete terms. When you back up your successful social media strategies with a retargeting campaign to recapture users who visit your site, you are truly capturing the value of social media. These audiences will allow you to create social and programmatic lookalike audiences that are also interested in your product. Thus, building on prior successes. There you have it, your 5-step solution to adding value to your business through a targeted social media strategy. For more on the importance of creating content that customers can relate to, read In the Beginning, there was Content. For more info on finding the right online audience outside of social media, read Capturing the Right Audience to Increase Sales. 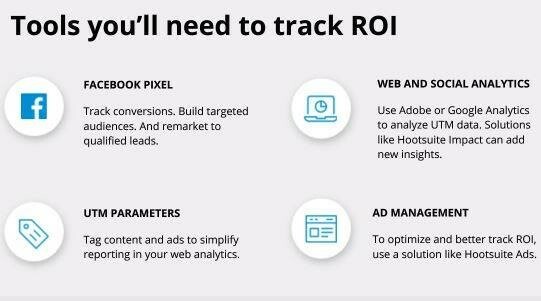 Pump up your team with the Social Media ROI Bootcamp webinar series from Hootsuite. As always, the digital team at UrgeMedia is ready and willing to answer any questions you might have about developing your digital marketing strategy. Give us a call at 970.328.8001. This entry was posted in Digital, Knowledge and tagged branding, digital, digital advertising, digital marketing, social, social media, social media marketing. Bookmark the permalink.